I’ve learned that in a reversal of internal government policy this past week, Conservative ministerial staffers are once again permitted to keep a Facebook profile on the popular social networking website. Indeed, Facebook has become the latest killer online app and for some, it has replaced email for messaging friends and scheduling events and parties. Earlier, I opined that the ‘corporate’ Facebook ban implemented by the Conservatives on their political staff was a shrewd move made to prevent a hungry media and opposition from exploiting personal material not intended for “front-page” exposure. A complete ban may have been harsh, yet the careless use of the site would have also been less than ideal. Thus, in policy refinement and compromise, the government has found a new optimum that works for everyone. I’ve learned that each department has been tasked with implementing a policy on the use of Facebook for their staff, particularly concerning which privacy settings ought to be adjusted to both allow employees the use of the popular social networking tool and to allow a government known for its tight messaging to keep any loose ends from sticking out. The policy might be considered analogous to any other employee code of conduct, but this one is specialized for a website. Ministerial facebookers will be pleased by the move and their employers will remain conscious of how to maintain the ideal balance. 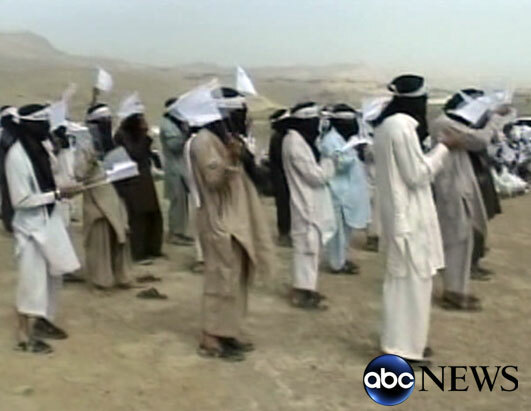 ABC News is reporting that a “graduation ceremony” for suicide bombers was held along the border region of Afghanistan and Pakistan on June 9th. Some of the bombers are intended for striking within Canada. Dust off those bongos, young progressive agent of change! In a news release from the Prime Minister’s Office today it was announced that US President George W Bush is coming to Canada on August 20th/21st for a North American leaders summit. Prime Minister Stephen Harper today announced that Canada will host the North American Leaders� Summit on August 20 and 21, 2007 in Montebello, Quebec. U.S. President George Bush and Mexican President Felipe Calderon will join the Prime Minister in Montebello, Quebec. The last meeting of the leaders of Canada, the United States and Mexico took place in Cancun, Mexico on March 31, 2006. Within the context of the summit, the leaders will review progress in their ongoing cooperation under the Security and Prosperity Partnership of North America, which was established to foster collaboration for a more secure and more economically dynamic North America. In Cancun, the leaders identified five priority areas for special attention in the coming year: strengthening competitiveness in North America; North American Emergency Management; Avian and Pandemic Influenza; North American Energy Security; and North American Smart Secure Borders. In other news, Canadian patchouli oil futures experienced heavy trading today. In Chatelaine’s July magazine, the home lives of the Harpers and Krieber-Dions are both featured. It is interesting to see the differences between the two families and what it those differences may mean to the much sought-after “ordinary” Canadian voter. Of course, a key element of the Conservative message is family. Targeted tax relief for families that have kids in sports and a child-care tax credit are among the policies emphasized by the party to capture this key demographic. The Harpers are the First Family of Canada, and every time you check in with them, they become more and more like the family down the street (or even your own). It was during these teenage years that Krieber took up acting, piano (she still plays) and painting. “With acrylics today – they’re environmentally friendly,” she quips. The Conservatives will likely try and contrast the Harpers and Dions in the role of Canada’s first family and will portray the Harpers (genuinely) as traditional, nuclear and ordinary. Dion may be the leader of the opposition, but Krieber is the CEO of Krieber-Dion Inc. She does the banking, writes the cheques, keeps the books, files the taxes and buys all of his clothes – even his underwear. … “He’s colour-blind. You don’t leave him in a house alone.” … It’s comments like this that have backroom Liberals shaking their heads. Says one, “Many suspect she controls him. She reads his briefing notes. He takes her advice and brings it back to staffers. She’s the one people need to go to in order to get to him. Who are people reporting to?” There’s even a suggestion circulating in Ottawa that Dion is saving a riding for his wife in the next election. Ordinary seems to be the operating strategy of the Harpers; Ben and Rachel are the ordinary kids in hockey and gymnastics, Stephen and Laureen are such an ordinary couple that one or the other may forget an anniversary, similar to the story of any other ordinary Canadian couple. They’re just so darn ordinary those Harpers! Indeed, their ordinary nature has helped shirk their “scary/hidden agenda” characterization. 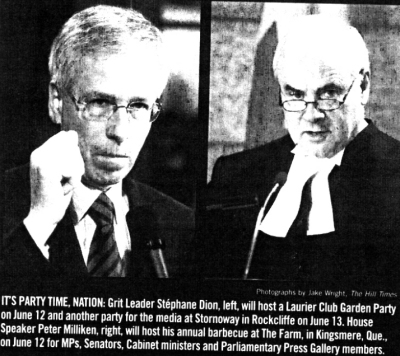 However, accounts of Dion – such as the one above – simply plays into the Conservative narrative that “Stéphane Dion is not a leader”. Mrs. Krieber is, to her credit, quite accomplished with complex sociological and academic views on terrorism and how it is driven by ideological radicals. However, with respect to “ordinary” Canadians, voters may find it more difficult to see themselves in the Dion-Kriebers than in the Harpers. Perhaps the last names of the two women are indicative as well to mainstream Canadian appeal. Mrs. Harper used to be Laureen Teskey before she famously stated “call me Mrs. Harper” after moving into 24 Sussex. However, Mrs. (Ms.?) Krieber remains Mrs. Krieber. Does the maiden name play with ordinary Canadians? The Harpers are banking that it doesn’t. Conservatives will have a lot of success portraying Mr. and Mrs. Harper as the ordinary Canadian family. Mr. Harper is an ordinary guy, with ordinary hobbies (hockey) with ordinary kids and some ordinary cats. The party will likely be successful because, by definition, the “typical” person is “ordinary” and can therefore relate. Can the Liberals make Dion an ordinary guy? Or is “ordinary” an inherent trait possessed by people like the Harpers (and a large number of Canadians). UPDATE: Some people have expressed dismay that I would label the Harper family as more “ordinary” than the Dion-Kriebers. I do not attach these labels as a means of passing moral judgment on any familial arrangement, but rather note “ordinary” as the meaty part of a normal population distribution. This is a commentary on political strategy without endorsement (it is rather a deconstruction). In real terms, I do not consider the maiden name to be an issue for me personally (this was never a post about my own preferences), however, I merely note that it may have some effect on “ordinary” in an electoral sense since since a large proportion abandons the maiden name upon getting married. Also, when deeming a person as “ordinary”, this is by no means a compliment. Having a PhD for example would do much to disqualify somebody as “ordinary”. Such an accomplishment is rather “extraordinary” (ie. rare). The same praise could be given to a modern woman that keeps her maiden name. HOWEVER, in a statistical sense, women that keep their maiden names and anyone that has a PhD are somewhat extraordinary and ordinary people may not see much of themselves within these types of people. As I have noted above, it may indeed be the strategy of the Conservatives to portray Harper to be as ordinary as possible in order to appeal to the majority of the population that is “ordinary” (by statistical definition). This sort of analysis is nothing new in politics and the same argument has been applied to politicians from John Kerry to Andre Boisclair. Both men did not reside within the “ordinary” range in many respects and this was likely a detriment to their electoral success because they couldn’t connect (ie. voters may not have been able to relate). Again, this is not a commentary on whether or not the electorate is at fault for behaving this way, this is merely an observation and dispassionate analysis of strategy as it relates to demographics. Here’s such a normal population distribution. It can represent a variety of population characteristics that are normally distributed from IQ to marks of a particular English class to average weight in kg. 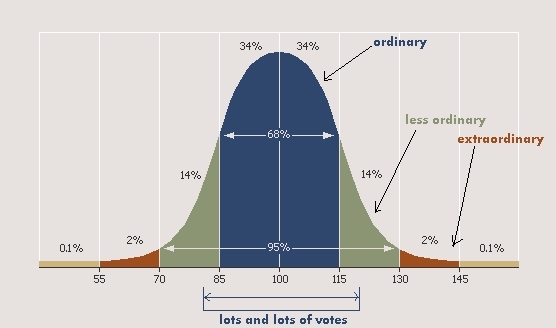 Since, as illustrated by the distribution, most people are in the ordinary range for a variety of traits that can be represented this way, Harper may do well to appeal to these people by being like them in as many ways as possible (and to find himself within the same range). In many ways, he already is. In other population distributions that are not normally distributed, it is arguably advantageous for Harper to find himself in the most heavily populated proportion of the distribution. UPDATE: Due to the overwhelming opinion generated concerning this post (some supportive, a lot of it angry) I wanted to measure the opinion and determine what went wrong. Most people seem to still seem to be hung up on “ordinary” (ie. “how can you say I’m not ordinary, I feel pretty damn ordinary thank you very much”). Perhaps I will try one last time to explain: in a purely statistical sense, “John” is a more ordinary name than “Tim” because a larger proportion of the population is named John. It’s not to say that Tim isn’t “ordinary” per se, just that there are more Johns than Tims and thus Johns are more common/ordinary. Perhaps there should have been less emphasis on the dichotomy ordinary/not ordinary and more of a focus on degrees of more and less. And that’s as far as I can break that down. Harper is a more ordinary character than Dion because his traits are common to more of the population than Dion. Again, no moral judgment there… sometimes it’s advantageous to be less ordinary, sometimes it’s not. My thesis is that at some level people will elect leaders that reflect them. This thesis is actually supported by this political science research article. I think that this post actually went south when I referenced maiden names and the propensity of a woman keeping them/losing them as a measure of more ordinary or less ordinary. Of course, this was meant to be a short reference to another example to support the overall thesis, but I’ve found that more people have become concerned by the issue than any other I’ve raised in this post. After I published this post, I ran it by a left-wing feminist friend of mine who works for the MSM (yes, they do exist) in Ottawa. While she disagreed with the thesis (see above), she did not find the post to be offensive to her in any way. In fact, she agreed that it was a dispassionate academic argument on a perfectly legitimate debate that has been going on in the “image” field of politics for quite some time. After hanging out with some of my other women friends tonight (all right-wing), I polled them. Half (2) thought that the writing was straight forward and well-explained, the other two thought that the post might be problematic. One explained that an issue such as retention of one’s maiden name after marriage is viewed as empowering to some women and that it’s generally a domain that men ought to tread lightly (if at all). Point taken and understood! So, I’d like to apologize to anyone that I’ve offended with respect to discussing the degree of “ordinary” in keeping one’s maiden name. I found myself out of my depth (and league!) In fact, I’ve learned a couple of facts including the fact that most women in Quebec keep their maiden name. I tried to weave the maiden name topic into my overall thesis but it fell flat. In retrospect, I shouldn’t have included it. From a few personal communications via email, I know that I have significantly offended a couple of people. My post was never meant to stir such emotion. For that I am so very sorry. For the record though, I should state that as a vocal promoter of other aspects of liberty, I fully support a woman’s choice with respect to choosing her last name in marriage.